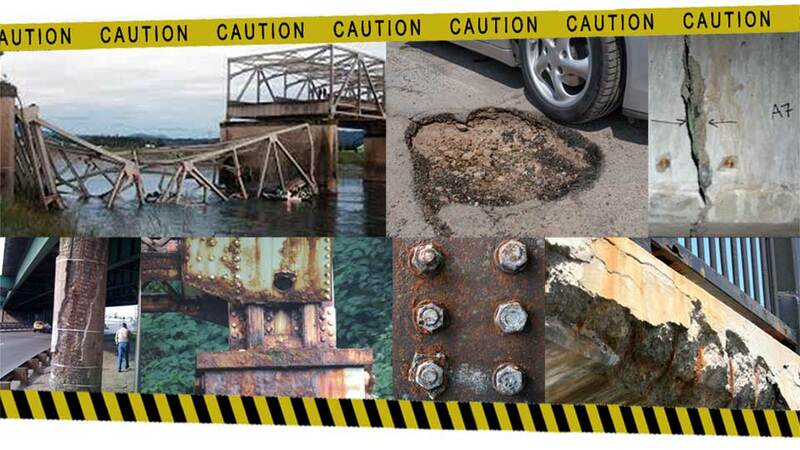 Fix potholes and make our bridges safe. We've been asleep at the wheel for two decades. Let's fix our crumbling roads and bridges now. Investment in our country's critical infrastructure has fallen by 40% in the last 20 years. Our roads and bridges are too often unsafe or congested with traffic. It's more than a minor inconvenience -- bridges are collapsing, potholes are causing accidents and damaging our cars and roadways are often nearly impassable due to traffic. We can't afford to kick the can down the pothole-ridden road any longer. The best option to expedite much-needed repairs to our infrastructure is for Congress to pass a long-term Highway Bill and to fully invest in our safety and the reliability of our roads and bridges. Congress has a number of viable options to bridge the gap between current infrastructure investments and what is needed to prevent further deterioration of our transportation system. That way we can avoid potentially catastrophic events like the tragic bridge collapse in Minneapolis. But we can't do it without your support. WHAT IS YOUR FAMILY'S SAFETY WORTH? Support a proposed Highway Bill that protects our safety and help us spread the word by reaching out to influential public officials. We’ve made it easy for you -- simply follow the instructions below. STEP 1: TELL US WHERE YOU LIVE AND WE WILL IDENTIFY YOUR ELECTED OFFICIALS. STEP 2: CHOOSE THE ELECTED OFFICIAL YOU WOULD LIKE TO CONTACT. STEP 3: CHOOSE YOUR PREFERRED METHOD OF CONTACT. A MESSAGE OF SUPPORT WILL AUTOMATICALLY APPEAR OR SEND YOUR OWN.